Is end finally near for Minnesota Senate showdown? (CNN) -- One hundred twenty-nine days on Friday. GOP Sen. 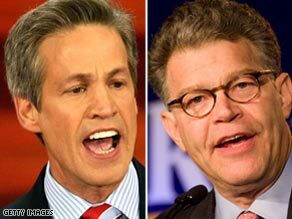 Norm Coleman, left, and Democrat Al Franken are in a battle for a Minnesota Senate seat. That's how long it's been since Election Day 2008, and still there is no resolution in the last remaining undecided congressional contest: the U.S. Senate race in Minnesota. But a resolution might soon be one step closer. Closing arguments were under way Friday afternoon in a courthouse in St. Paul, Minnesota, for the dispute between Republican Norm Coleman and Democrat Al Franken. Lawyers for both candidates were summing up their cases, after which a three-judge panel will begin considering a verdict. Coleman, the freshman senator who's seeking a second term, led Franken after Election Day by 215 votes out of nearly 3 million cast in the contest. That tiny margin triggered an automatic recount, which took nearly two months to complete. Franken, the progressive radio talk show host, comedian and former cast member of "Saturday Night Live," led by 225 votes after the statewide recount results were announced at the beginning of this year. Coleman contested the results and took the case to court. The key issue in the proceedings is whether some rejected absentee ballots should have been included in the recount. The verdict by the three-judge panel may not mark the end to this long-running saga. Its decision could be appealed to the Minnesota state Supreme Court. That could keep the seat vacant for quite some time to come. Senate Majority Leader Harry Reid has ruled out trying to seat Franken without certification by Minnesota's Republican governor and Democratic secretary of state. An attempt by Senate Democrats to seat Franken without an election certificate and before all legal proceedings were settled would be sure to spark a partisan fight. If seated, Franken would become the 59th member of the Democrats' coalition in a chamber that requires 60 votes to break a filibuster.